OK seriously, why on Earth did it take so long for this to happen? The e-Motion Motorized Open & Close Umbrella takes one-touch open and close functionality to the next level. It doesn’t just snap open and flop closed when you press the buttons on the handle. 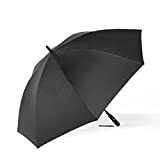 It’s actually equipped with a motorized mechanism that opens and fully closes the umbrella without any user assistance required. Just press a button and you’re done!